Here’s your chance to be heard, Babyologists, if you have something to say to the world – or at least to your family and friends. Spell it out with Design Letters! These magnificent Design Letters are proving a huge hit in Denmark and it won’t be long before everyone wants in on the action. If you don’t have something to say, a special person’s name is always a great option as is stating the obvious, such as ‘books’ on a bookshelf and ‘sleep’ above a bed. 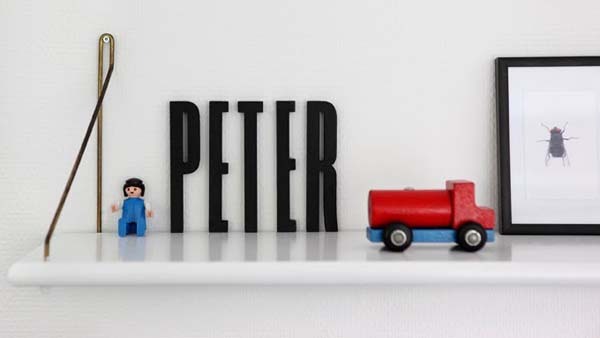 Design Letters are twelve centimetres tall and made from wood. They come in pink, black, orange, purple and turquoise so the options are endless. Stick with one colour, mix it up with two or really let your artistic licence run free with all five colours! Letters come packed in a nice cotton gift bag with their own adhesive, oddly referred to as “elephant snot”. The mind boggles at the thought! Fabulous for letter recognition and cute to boot, you can get yours for 30DKK (around AUD$5.60) per letter from Olgas Oldeborn. Delivery from Denmark to Australia is available.